Our spacious, family-friendly, three-bedroom condominium at Blue Lupine condominium is located on Highway 30A in Blue Mountain Beach only five minutes from Seaside, Watercolor, and Grayton Beach and 15 minutes from Sandestin. Our condo is on the second floor, is professionally decorated and has highspeed wireless internet. The master bedroom, with its private balcony and bathroom Jacuzzi, and second bedroom, with a private bath, each have queen-size beds and the third bedroom has two sets of bunk beds. A full bath is located in the hall next to the third bedroom. There are ceiling fans throughout the condo. We have a crib, high chair, and beach chairs and umbrella in the unit for your use. Beach chairs and umbrellas are also available for rent on the beach in the summer. A fully equipped fitness center is on the third floor. There is covered parking for one of your vehicles with gated access, and outside parking for additional vehicles. Our condo is great for one or two families. All 48 units in this four-story complex open onto a 50-foot-high atrium with sofas and chairs throughout. Tables and chairs are located in the atrium for playing cards and other games. Our condo faces East and is a few steps along the atrium to the elevator and stairs to the first floor and out to the pool area and beach. The pool and hot tub serving the units overlook the emerald waters and crystal white sands of the Gulf of Mexico. The pool and hot tub area is gated, with keypad access for privacy. Blue Lupine is located between The Retreat and The Village at White Cliffs, two non-renting, upscale private developments. Blue Lupine is about midway between Destin and Panama City Beach (20 to 25 miles from each), away from the congestion but close enough for a trip into either. We are within minutes of concerts, wine tastings, and other events at Seaside, Watercolor, and Grayton Beach. The unit is only 15 minutes from Sandestin and Baytowne Wharf and some of the best golf courses in the country. Silver Sands outlet mall is about 15 minutes away. Great restaurants are just down the road and there are deep sea fishing charters out of Destin and Panama City. We rent from Saturday to Saturday. No long term rental inquiries please. Just spent a week at Blue Lupine with my sister’s family. Total adults: 4; total kids: 4 + a baby. Two bedrooms plus a Bunk room was perfect for our size. 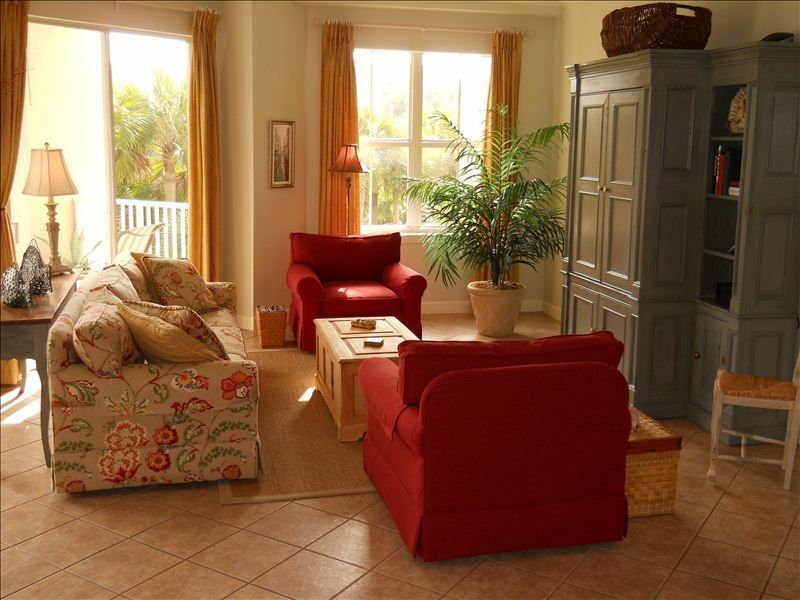 You can’t get much closer to the beach than Blue Lupine and this condo is top notch. Not too frilly to make you feel like you can’t relax but definitely nice enough you want to come back. The owners even have beach chairs and an umbrella in their cage for your use. As far as the area Blue Mtn is perfect for families. The beach is generally not very crowded ; the pool is between your room and the beach ; the sights and sounds of 30a are close by and you always have a good chance of seeing the Blue Angels do a flyover! Only con for our situation: beds are queens and we’re used to a king so just prepare to get close and snug with your significant other! Make sure to get some ice cream at Blue Mtn Creamery and have dinner at Stinky’s. Both are delicious and worth the waits! We had a wonderful holiday in Blue Mountain Beach. The condo and owners are a gem! The condo is beautifully decorated and well appointed.The location is fantastic, the beach is stunning, the community is so friendly. Wish I had more vacation time to extend our stay. Lovely week! Wonderful stay at Blue Lupine, unit 203, Blue Mountain Beach. We were fortunate to have exceptional water and beautiful weather. Our condo was a nice, restful unit to call our home for the week. Kitchen was well equipped, furniture was comfortable, giving us plenty of space for 7 people. Thank you for sharing your beach home with us! We had a tremendous time at your condo. It was a very nice place. A great place for family. We enjoyed the stay. Beautiful condo with everything you need. The owners are in contact to make sure everything goes smoothly. The complex is not very busy although it make have been due to tropical storm Alberto which did not allow for the most ideal beach vacation. Guess most people canceled but that was not an option for us and I highly recommend not taking the renters insurance because it has to many loopholes that will never pay you. Now I have learned. However.. it was a superb location and awesome unit!!! I will return again! Wonderful condo with great amenities. It's our 8th year at Blue Lupine. We wouldn't think of spending our spring break anywhere else. We were particularly fond of this unit. Extremely clean. Good appliances. Excellent layout. Fit two families perfectly.